Are any of you big coffee drinkers? 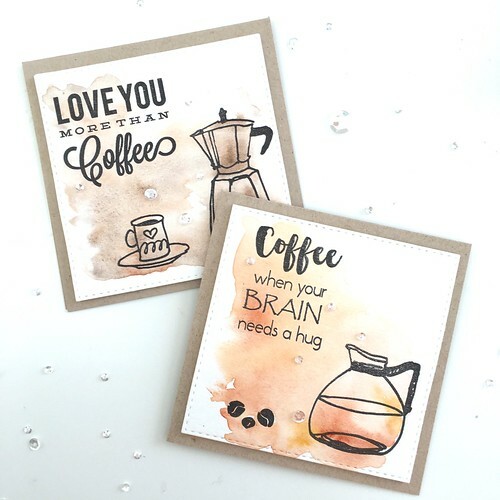 I will say that I’m not a big lover of the caffeinated beverage, but I do indulge in some coffee every once in a while – as long as it has a lot of cream and sugar in it! 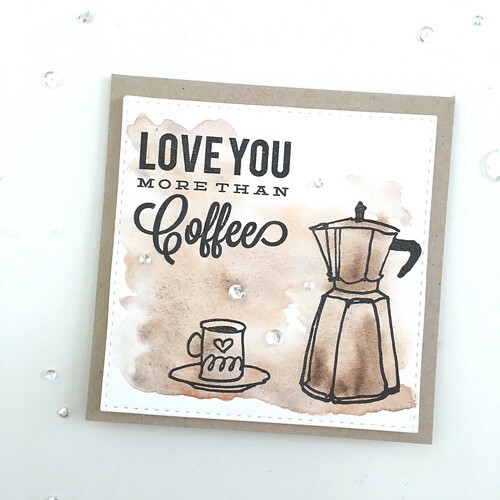 Even though I’m not an every day coffee drinker, I love the illustrated/line drawing quality of this stamp set, so I made sure to order it a few weeks ago! And for this small set of 4.25″x4.25″ cards, I did what I generally like to do – stamp a few images and add a watercolor wash. I find it’s a good way for me to “break in” a new stamp set lately. 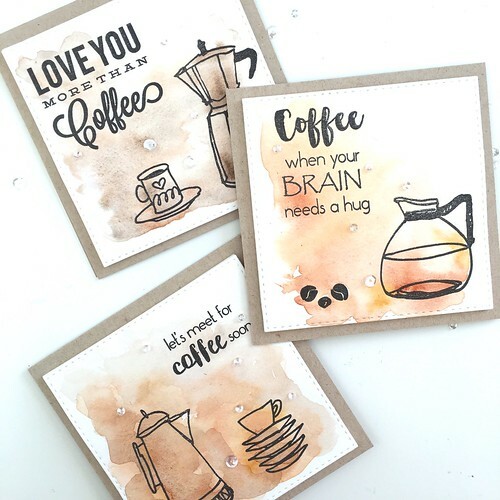 So, I cut my watercolor panels (I like Canson watercolor paper) and stamped a few different images and sentiments on each panel from the Coffee Love stamp set. 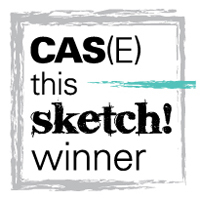 I used Simon Says Stamp Intense Black Ink for this, because it’s waterproof. I used my Gansai Tambi Watercolor set and various cool and warm brown tones to create different colored washes on each panel. Once they were all dry, I used a stitched square die to cut each panel a bit smaller, and then mounted each onto a card base cut from Neenah Desert Storm card stock. I added some clear sequins to each panel to finish everything off! Such cute cards! 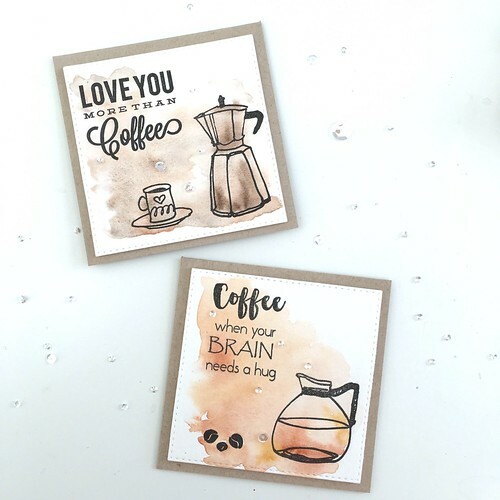 These cards are especially impressive because of the way you’ve managed to manipulate shades of brown–you’ve taken what could have appeared dingy or dirty and made happy, fun, adorable cards! Aw, thanks Lael! You are so sweet.